When the nationwide goods and services tax (GST) was introduced a year ago, it was accompanied by both fear and hope. The fear was that it would be used as an opportunity by firms to raise prices while the hope was that it would lead to a convergence of prices across states and cities. One year later, the evidence on GST is mixed. While prices have not gone up, the expected convergence has not materialized fully, an analysis of price data collated from online grocer BigBasket.com shows. The analysis is based on 71 items representative of a middle-class shopping cart and drawn from 18 categories of the Consumer Price Index (CPI), the yardstick used to measure retail inflation. The analysis shows that the price at which the basket of goods is being sold has fallen across cities. The fall in prices has been sharpest in Bengaluru followed by Chennai. 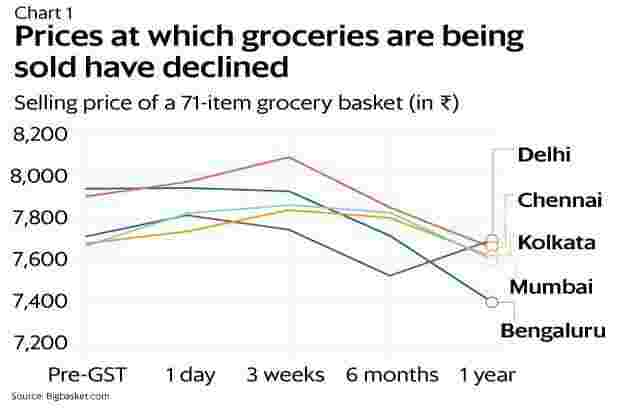 The decline in prices has largely been driven by a rise in discounts offered by the retailer (BigBasket), rather than a decline in the maximum retail prices (MRP) charged by companies. The rate of discounts has risen sharply over the past year, especially in Bengaluru. 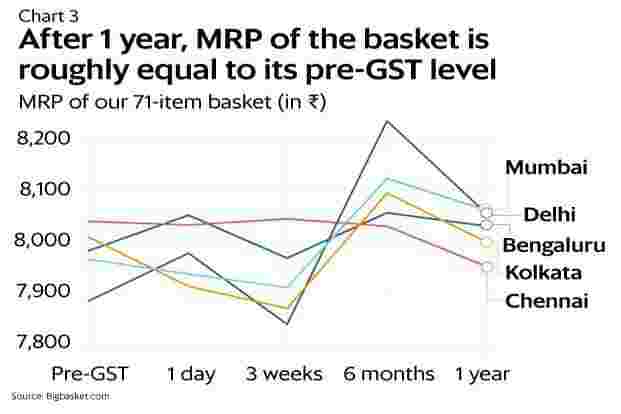 The MRP of the grocery basket analysed rose in the first six months after the introduction of GST but has declined since then, during a period that saw some companies come under the government scanner for not passing on a reduction in tax rates. Over the one-year period, the MRP of our basket has increased slightly for three of the five cities: Bengaluru, Delhi and Mumbai. It has declined slightly in the other two cities. The analysis shows that the pre-tax value for most products—across cities and time frames—has mostly remained the same. The same holds true for GST rates. However, the markup charged by companies varies across cities and time frames, leading to consumers paying different amounts for the same product in different cities, and at different points in time. 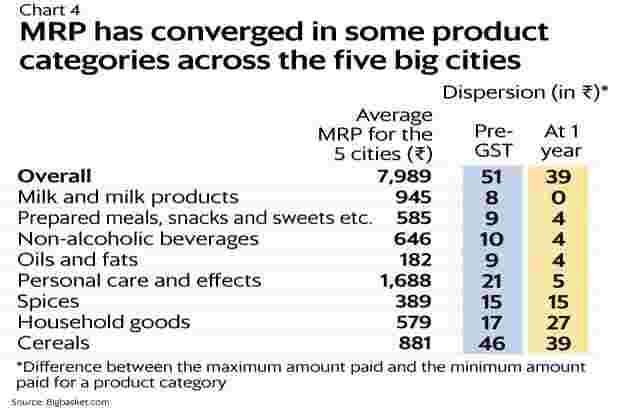 One year after GST, the markup of our basket as a share of MRP is the same for three cities and has increased for two cities. Bengaluru recorded the highest increase, from 6% to 11%. 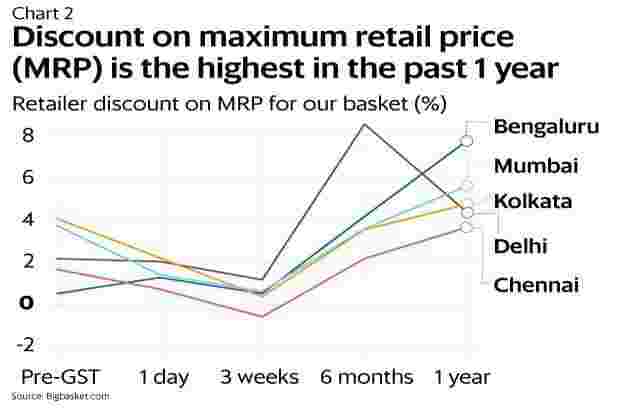 It is only because of the higher discounts offered by BigBasket in Bengaluru that consumers there have not faced the brunt of the higher markups. Among product categories, the increase in markup is the highest in spices (5% to 21%), followed by non-alcoholic beverages (7% to 15%) and personal care (8% to 12%). Cereals (9% to 6%) and household goods (7% to 4%) saw a decrease in markup. One year after the introduction of GST, the promise of convergence in prices is yet to be met. While product prices have converged across some categories, this is not true across categories. The GST promise of “one country, one price" is still a work in progress, the analysis shows.